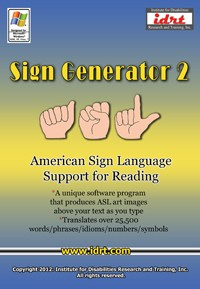 Use the Dictionary to find and print graphics of specific signs. Customize Flashcards using any of the over 9,000 signs in the database. Choose whether to have signs only, words only, pictures only, signs & words, or signs, words & pictures. Make your own Matching Worksheets, so your students or children can learn to associate English words with signs. Re-scramble the words to create new challenges.